If some Kickstarter projects are to be believed, there is a revolution coming in the console gaming space. People don’t want to spend lots of money on big consoles with lots of wires and closed platforms, so it is said. Last year, we saw the first of these alternative-to-Sony/Microsoft/Nintendo projects come to get a lot of attention with Ouya. Today, there is the GameStick. The console itself looks more like a thumb drive than anything else, and it simply plugs straight into an open HDMI slot on you TV. When you want to take the console with you, over to a friend’s house, say, GameStick fits into a slot in its Bluetooth controller for maximum portability. The Kickstarter for the project went live just today, and as of this writing is sitting at ~$39,000 out of their $100,000 goal. If all goes well, PlayJam hopes to launch GameStick in April of this year for $79. London & San Francisco; January 2nd, 2013; PlayJam, the global platform for casual and social games on Smart TV, launched its Kickstarter campaign today in a bid to bring its dedicated games console – GameStick – to life. 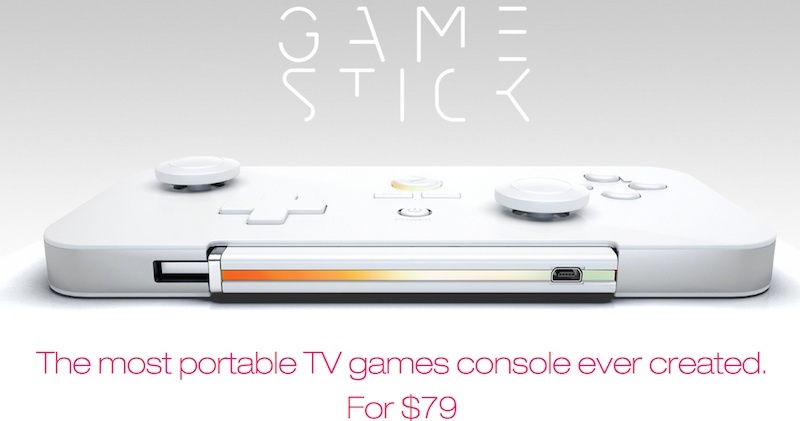 The team behind GameStick hope to accelerate the race to change the face of big screen gaming with the launch of the most portable, affordable, dedicated TV gaming device on the market priced at just $79. GameStick is a small yet powerful, dedicated games console that plugs directly into a TV’s HDMI slot and comes with a fully featured Bluetooth controller – ready to go right out of the box. When on the move, the two combine into a single unit, putting big screen gaming right into the pocket. The device will be compatible with other Bluetooth controllers enabling true multi-player functionality. The 30 day Kickstarter campaign launched today with the team at PlayJam looking to raise a minimum of $100,000 to help make GameStick a reality. Supporters of the project can get involved by pledging as little as $10. GameStick will feature a purpose-built game store through which users will be able to browse and download content. The proposition will be powered by PlayJam´s existing Games Network for Smart TV which currently supports developers such as Relentless Software, First Star Software, and Disney. To date, the team has been focused on bringing GameStick to its pre-production phase by finalising hardware design and integrating the back end technology to power the service. They have worked with a small beta group of developers to announce the following initial line-up. Now that the project is public, the team hopes to work with all Android developers looking to get their games onto the big screen. GameStick´s Bluetooth controller uses different modes to allow the gamer to access and play 100´s of compatible games directly onto their TV. console – this is changing. GameStick gives the thousands of Android developers out there an additional route to bring an affordable big-screen gaming experience direct to their fans. What´s more, we wanted to do this via a unique, highly portable device that will enable pure social gaming – by that we mean people sharing great experiences in the same room!” Smith concluded.